CHELSEA — The fate of a tiny patch of land on W. 20th Street has already been decided in the minds of most members of Community Board 4 — but neighborhood park proponents aren't accepting it. The 10,000 square foot parking lot at 136 W. 20th Street, soon to be vacated by the Department of Sanitation, is sparking tensions over two things that are scarce in Chelsea — green space and affordable housing. In September, the 20th Street Park organization began its push to put a pocket park on the lot, for the benefit of seniors and small children who may live a full 15 minute walk from Madison Square Park, the Hudson River or the High Line. But Community Board 4 has a longstanding commitment to put housing that is affordable to moderate and middle income families on that site, a position CB4 reaffirmed earlier this month, in a letter that described the future of 136 W. 20th Street as a matter closed to debate. Park protesters at a January Community Board 4 meeting. "Our supporters aren't going away," said 20th Street Park's chair, Matt Weiss, who noted that in the past month or two, the organization has received about 300 new letters of support. "We are disheartened that the community board is choosing to ignore the fact that the needs and priorities of a neighborhood can change." The next steps for the parks campaign will include a February meeting with City Council Speaker Christine Quinn and working with supportive local businesses including galleries and indoor play spaces to host rallies, according to Weiss. In recent weeks, some 20th Street Parks members and supporters have grown increasingly aggressive in their criticism of CB4. In an open letter sent earlier this month, they accused the Board of various "distortions." In one case, they note that CB4 for several years expressed support for a potential park on the 136 West 20th St. in its Statement of District Needs. CB4 members have described this as the result of an administrative error that did not take into account the affordable housing commitment. "This idea isn't getting a fair shake," said Geoffrey Croft, who is the founder of NYC Park Advocates employee and is advising the 20th Street Park group and called CB4's unwillingness to reconsider the matter "sad" and "embarrassing." Croft also disputed the board's description of the proposed housing units as "affordable." saying "most poor and working class folks - which make up the majority of residents in NYC" might find the units out of their price range. The unit prices of the proposed housing have not yet been determined. But the city's formula for calculating the cost of the units is based on a percent of the average New York family household income, and could make those with incomes anywhere from less than $62,000 up to approximately $130,000 per year eligible to live there. The attack strategy isn't helping matters, in the view of CB4 waterfront and parks committee member Robert Trentlyon, who a decade ago waged a successful battle to reverse the board's position on Pier 64, which is now a green recreational space. "I don't think there is a solution," Trentlyon said. "The train has left the station, and they weren't on it." Trentlyon said he's sympathetic to the desire for parkland, having raised his own children in Chelsea at a time, decades ago, when the neighborhood had far less green space even than it does today. His granddaughter now plays in Madison Square Park. But amid rampant gentrification, safeguarding reasonably-priced living spaces also remains a priority. 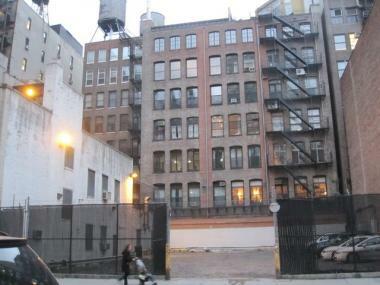 "The word affordable housing is a mantra in Chelsea," Trentlyon said. "You say 'affordable housing' and everyone salutes."